Single Girl Gourmet: What does fall mean? Butternut squash! I don't like to be cold, so I'm not a fall fan, but I absolutely LOVE butternut squash. It's so sweet and delicious. I also like that it's something that is really only available when it's in season, it gives me something to look forward to, but a lot of butternut recipes are for soup. Eh, not such a fan here, I'm always looking for other uses and I love that too - there are possibilities out there, I just gotta look for them! 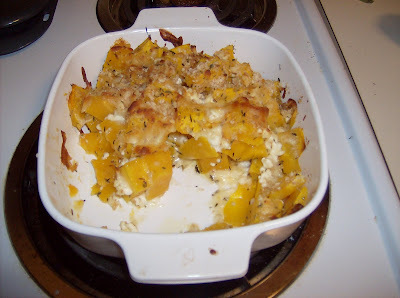 So I'm sharing one of my favorite butternut recipes. I like it for several reasons (not a soup! ), it's versatile - can be an entree or a side and you can make as much or as little as you want, perfect for a single girl. Heat oven to 350 degrees. Place butternut cubes in a non-stick baking dish Coat butternut cubes lightly in olive oil (not too much, will make it greasy), sprinkle thyme on the cubes when mixing the oil on them. Sprinkle cheese on top (for 3-4 cups of butternut cubes, I use about 1/3 cup of cheese, this will make it pretty cheesy)or you can try to mix it in a little so it's in the middle and top. Next sprinkle a little salt and pepper (to taste) and about 2 tablespoons of bread crumbs on top. Bake approximately 30-40 minutes or until squash is soft. To cut cost, I often use a little bit of feta and supplement with some mozzarella. See the photo of the finished product above...you'll notice part of it is already gone, yea sorry about that I was really hungry and kind of forgot to take a photo first. This will likely be a reoccurring theme. One thing I don't like about butternut - otherwise it would be a perfect love affair - it's a pain in the rear to cut up. I advise a sharp knife and to be careful. I'm not sure if this is because I'm not buying the right ripeness, sometimes it seems easier than others but if you have any tips, I'd be glad to hear them. Do you have any butternut recipes you'd like to share? I want to hear 'em! If yours sounds yummy, I will try to make it and post it on the blog.